“Almost one in five academic staff in the region – including lecturers, researchers and support workers – are on the contracts, which do not specify working hours, or give certainty of income. “At the University of Wolverhampton more than half of academic staff are on zero hour contracts – 773 staff in total. Help Me Investigate Education began looking at the figures after the University and College Union (UCU) sent FOI requests to universities around the country and comparing the numbers on zero hour contracts with figures on staffing from the Higher Education Statistics Agency (HESA). 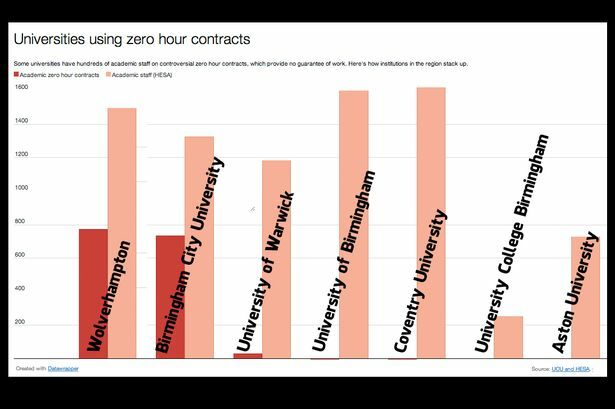 However, one university – Wolverhampton – appeared to have more academic staff on zero hour contracts than their entire academic workforce. Persistent phonecalls to Wolverhampton University and the local UCU branch eventually brought us to the real figure, which was twice the one recorded by HESA. We also spoke to HESA’s press office to find out why this might be the case. It seems zero hour staff may come under ‘atypical staff’ – not recorded in the main staffing figures, although this doesn’t explain the disparities between institutions. We’ve published data on atypical staff in a separate post on the Birmingham Datablog. Read the full article in the Birmingham Mail’s Behind the Numbers section, a partnership with Help Me Investigate and Birmingham City University’s School of Media. This entry was posted in Uncategorized and tagged birmingham city university, Birmingham Mail, HESA, Higher Education Statistics Agency, Nicole Froio, UCU, University and College Union, Wolverhampton University, zero hour contracts. Bookmark the permalink. Piece on here re zero hrs may be useful . Offers historical analysis which is so needed. I know people on zero hrs, had no money for weeks. All jobs will go that way. What are unions doing?